HERE ARE THE WORDS, directly from the source, that Angela Merkel uttered in Brussels earlier today – and which have caused a flurry of diplomatic activity across Europe this evening. 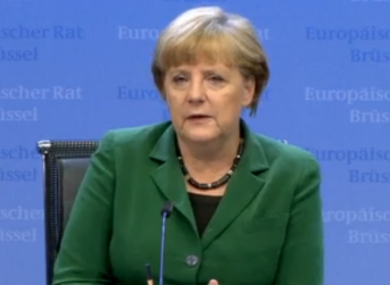 The comments came towards the end of a press conference with German reporters in Brussels. It is common for individual heads of government to conduct a national press conference, separate to – and often clashing with – the official conference held by Herman van Rompuy and Jose Manuel Barroso. This time, Merkel’s conference did not clash directly with those of the European leaders – but did, coincidentally, happen to take place at the same time as that of Enda Kenny. Merkel had spent the bulk of the conference discussing the agreement of EU leaders to lay the legal foundations for the new Single Supervisory Mechanism – the new pan-European banking supervisor which must be in place before the ESM bailout fund can contribute to the recapitalisation of banks. The chancellor had pointed out that the new regulator would take some time to establish – and made the point that even the recruitment of suitable staff would take a considerable time. She was therefore asked whether her apparent lack of urgency on setting up the new regulator was connected to the fact that she must herself face the electorate in September 2013 – around the time that the ESM could have to chip in with a rescue for Spain’s banks. The exchange below took place in German, but the English translation given is the one added to the live international broadcast by the translation services of the European Council. Oliver Grimm of Die Presse, Vienna. Madam chancellor, there are a few voices here and there that say your reticence on the time plan for the banking union has something to do with the elections in Germany taking place next year. Is this simply a malicious sort of slander, or does it have something to do with you having to… if the banks have to be capitalised, explaining to the German voter again why they have to cough up to the money? Or are you actually completely free in your mind and the elections have no role to play in this at all? No matter what I’m going to say, it will probably not be the right answer by your senses. I haven’t even thought about this before you said it. I mean, the Spanish banks have just undergone an evaluation process. They have capital requirements of which we have heard, now, for the first time specific figures. The banks have some kind of programme under which the banks can be recapitalised – the Spanish banks, that is – and Spain has to ask for these tranches. It will not be a retroactive direct capitalisation. If recapitalisation is possible, it will come for the future. So if the banking supervision is in place, then we no longer have any problems with the Spanish banks. That is my hope. Because already in 2012 I have decided on a programme of recapitalisation of Spanish banks. I must say it’s completely far from my mind, this kind of idea. Let me tell you again: two to four hundred people are needed into what is a completely new institution, who on the 19th of October don’t even have a legal kind of basis. It’s not even on the horizon for the time being. Nobody can ensure me that this will work better than anything we have in place right now. If we were to throw these people into this authority as of the 1st of January, I mean, it’s [as] clear as the day*. * The exact phrase used by Merkel here was ‘klar wie Kloßbrühe’, a German turn of phrase which literally means ‘clear as dumpling broth’, but has been translated by Oliver Grimm himself as ‘plain as a pikestaff’, another colloquial phrase. Email “Here's the exact transcript of Angela Merkel's comments in Brussels”. Feedback on “Here's the exact transcript of Angela Merkel's comments in Brussels”.